Commodities was a dance-music-theater work inspired by the aggressive, breathless world of the Commodities trading pits in Manhattan and the people who thrive in them. 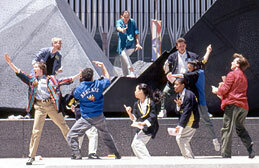 Traders formed part of the cast, and I used their complex hand signalsheightened and abstractedto create the dynamic physical language. Recorded interviews with the traders, sounds of the trading floor and original music formed the score, portions of which were broadcast on NPR's Marketplace. The audience was composed of stunned and delighted Wall Street workers on their lunch hour, one of whom commented, "I had no idea that what we did was so beautiful." The traders are on the one hand tremendously powerful. But they are also driven by the very system they create, besieged by a constant barrage of orders from investors, phone clerks and runners in an intricate network of relationships that stresses human communication to the breaking point. In all, there seemed to me something quintessentially American in the swashbuckling, can-do spirit of traders who take big risks, act on instinct, live completely in the moment, and are so hopeful about their "Futures" and "Options." There is an added poignancy to the fact that computers may soon make their workplace a thing of the past. I remain excited about creating a larger theater piece inspired by this material. NYC commodities traders and members of Sabrina Peck performance Company: Ray Bergen, Tom Brennan, Jennifer Chin, Darcy Cosper, Matt Frederick, Eric Handman, Phippy Kaye, Kate Pagliasotti, Jennifer Tsukayama, Michelle Yard, Camille Costan-Toth, Leah Heron-Matthews and Eugene Irby. "During his 12 years as a commodity trader, Ray Bergen has been asked to do a lot of things. But Sabrina Peck was the first to ask him to dance. 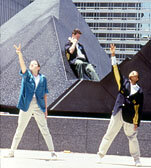 So at 1 p.m. today, he will slip on his sneakers and trading jacket and dance on the plaza of the World Trade Center." "I told my Dad it's like sports--you're winnin', you're up, you want to put the screws to 'em and put 'em away." "Its like a poker game. The third guy from the left is a panic trader--he panics--and I want to see if I can panic him." "The best of them don't have dark times--they just play."